Samsung has already witnessed the incredible popularity of the Galaxy Note II with its boosted sales figures. Now the South Korean Tech Giant is rolling out the successful device under the Galaxy hood in pink color option especially for the Valentine’s Day eve. Samsung galaxy Note II sports a 5.5-inch Super AMOLED display which bears a display resolution of 1280 x 720 pixels. It has been powered with a 1.6 GHz Quad-Core Exynos Processor accompanied by 2GB of RAM. The tremendously powered device runs on Android 4.1 (Jelly bean) operating system. It packs an 8MP Rear Camera along with a 2MP front-facing camera. The connectivity features of the device includes 3G, Wi-Fi, Bluetooth, NFC and USB. 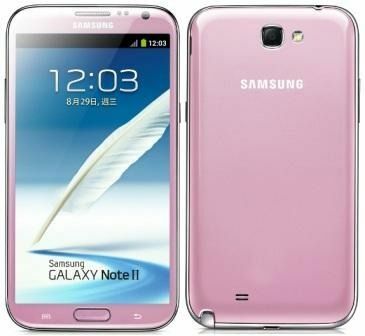 Samsung Galaxy Note II all colored in pink is expected to be available for sale anytime during the Valentine’s week. Even in the previous year, Samsung had introduced the Galaxy Note in a light pink color. We would expect many of the lovebirds to grab the pink colored device as a gifting option for the Valentine’s day.